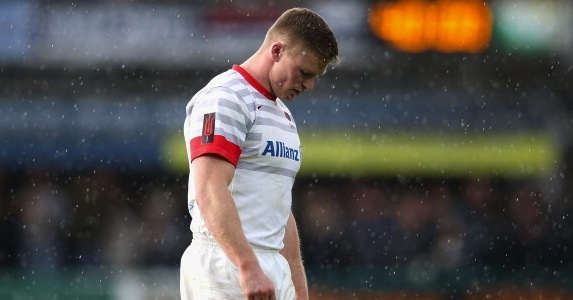 CHRIS ASHTON is set to attend an RFU disciplinary hearing this evening, where it is feared he will be handed a one-match suspension after picking up the equivalent of three yellow cards so far this season in the Aviva Premiership. The Saracens winger has scored 15 tries in 26 Tests for England, although he has failed to cross the whitewash in his last nine matches. Ashton picked up yellow cards against London Irish in the season opener, against Exeter Chiefs at the end of September and has been cited for a dangerous tackle on former Northampton teammate Vasily Artemyev in last weekend’s fixture at Franklin’s Gardens. If Ashton is given a one-match ban, as expected, it means he will be unavailable for England’s first match of the QBE Internationals against Fiji on November 10th. It leaves England with only two other specialist wingers in the squad in Ugo Monye and Charlie Sharples. Monye has been widely tipped to regain the No11 shirt after time away from the senior England side, whilst Sharples is now the frontrunner for the 14 shirt, and looks set to add to his two England caps from last season. Stuart Lancaster does however have other options within the squad to cover the vacant right wing position. Jonathan Joseph is expected to be back in training next week after picking a knock in London Irish’s defeat to Harlequins on Sunday, and the young back has experience playing for Irish on the wing at Premiership level. Looking outside of the 32-man squad named for the QBE Internationals, England also have several candidates in the Saxons squad and outside it who could come in. Christian Wade has continued to impress for London Wasps this season, with seven tries in eight appearances. Tom Biggs is another contender from Bath whose good form deserves international recognition. Beyond the Saxons, two names should be on England’s radar. James Simpson-Daniel has been at his typical mercurial best for Gloucester in their early rise to second place in the Aviva Premiership table. Seemingly destined to never be given a proper run by his country, Ashton’s absence could be the perfect chance for the 30-year old to come in and prove his worth. Another long shot is London Irish’s Topsy Ojo. Now 27, Ojo has not played for England since the 2008 tour to New Zealand but so far this season has continued to showcase his impressive finishing abilities, with five tries in eight starts. He also recently became Irish’s all-time record try scorer with 64. Ashton will undoubtedly return to the England team for the next Test on November 17th against South Africa, but the Fiji match could offer any one of Sharples, Wade, Biggs, Simpson-Daniel or Ojo an opportunity. For now though, England have lost another crucial starter to go with Ben Foden, Tom Croft and possibly Dylan Hartley and Courtney Lawes – important players whose quality will be missed.